← Lightroom 5 Released: Worth the upgrade ? What’s the fuss about Thunderbolt ? If you paid attention to the recent Apple product releases, particularly Mac Pro, you know that they are going full tilt Thunderbolt. For a couple of years now, all Apple products sport a Thunderbolt port and clearly folks in Cupertino believe that this technology will provide their customers with the best computing experience. There are some Thunderbolt sightings on the Windows side of the world as well but for now, it is predominantly Apple. So, you may ask, what’s the fuss ? What does it mean to an average Joe Photographer ? Well, as of now it means nothing. Period. At the moment, there is nothing compelling that this technology would offer to photographers. There are likely some benefits for video folks who have a need to process huge amounts of data and have accordingly big budgets. And we are not talking about a wedding videographer covering your cousin’s ceremony. We are talking “Lord of the Rings” here. In 4K. But it is an entirely different cattle of fish. Let’s take a closer look at the details. First of all, Thunderbolt was developed by Intel and in it’s initial incarnation promised to deliver data rates up to 10 Gb/s. Just a few weeks ago Intel released specs of the second revision, which doubles the speed to 20Gb/s. Comparing this to other popular interfaces: USB 3 (5Gb/s), SATA 3 (6 Gb/s), it is mighty quick. Without getting into too much of technical details, Thunderbolt combines two different protocols: PCI Express (PCIe) and Display Port. The controller will switch between the two automatically to allow for connection of various devices: hard drives, monitors, etc. They can also be daisy-chained. Ok. This sounds good you might say. What’s wrong with this picture ? You could connect a Thunderbolt storage device (Hard Drive) and you’ll be able to move data at an amazing speed. Right ? Wrong. Unfortunately, the bottleneck is not at the interface protocol level. It is the nature of hard drives that limits how fast you can move data. The sustained transfer rate is lower of: disk-to-buffer rate (currently around 1Gb/s for a typical 7200 rpm drive) and buffer-to-computer rate, which is determined by the interface protocol speed (for example: SATA 6Gb/s). Sure, you could buy HDD spinning at higher rpm but it will still be much lower than even SATA 2 can deliver. There are two ways to go around this limitation for external storage devices. The first one would be to use a RAID Array configured in RAID “0” (Stripping) mode. That would allow you to connect 5 HDDs (using for example Drobo 5D), which would give you theoretical transfer rate 5x that of one HDD. By doing this you would still be within what USB 3 or SATA 3 can deliver. No need for Thunderbolt. So what is the second option ? Go with an SSD (Solid State Drive) device. They don’t have the disk-to-buffer limitation and the fastest of them are close to saturation point of SATA 3 interface. If you wanted to connect them in RAID “0” then you would need a faster interface (read Thunderbolt) to transfer data to an external storage. The downside ? Cost. As of June 2013, SSDs just barely broke the $1/GB barrier so be prepared to pay approximately $200 for a 240GB drive. So, what’s the big deal ? Actually, I think that it will be another 4 years before we see all benefits of this technology in their full glory. This is based on two premises: Firstly, earlier this year SATA-IO (Industry consortium developing SATA standard) announced a new standard called SATA Express (no, there will be no SATA 4 or SATA 12 Gb/s). It will allow drives to bypass SATA overhead and use the full speed of PCI Express (PCIe) interface, which at the moment is 8Gb/s per lane. The new standard allows for two PCIe lanes increasing throughput to 16Gb/s. The new PCIe 4.0 will double that speed to 16Gb/s per lane. At the same time, SATA Express will be backward compatible with older SATA versions and it will automatically recognize what kind of drive is attached. The first SATA Express drives will probably start trickling into the market next year and in my view it will be exclusively in SSD flavour. The good, old HDDs will still have the same “disk-to-buffer” limitation. The second factor driving the adoption of Tunderbolt will be the price of SSDs. Since they are based on Silicon memory chips they are governed by Moore’s Law. This means that around 2015 they will break $0.5/GB barrier and by 2017 they should drop below $0.25/GB. At that point you will be able to buy 1TB SSDs in SATAe format at reasonable price (below $200) and use it for super fast external data storage. We are talking about speeds that will require throughput of a Thunderbolt or similar interface. What should we do in the mean time ? Sit tight, do nothing and wait for the prices to fall. The only people screwed in the short term are Mac users who will essentially be funding the development of the ecosystem. But I haven’t heard any complaints from them so they must be ok with that. Finally, a few words about the image at the top of the post. 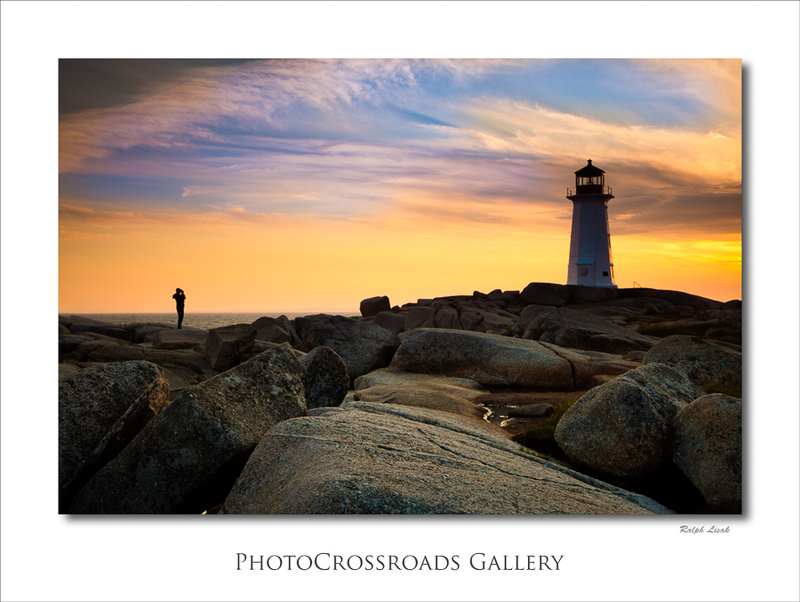 It was taken in Peggy’s Cove not far from the capital of Nova Scotia, Halifax. The lighthouse is probably the most photographed lighthouse in Canada so I couldn’t resist when I went to Halifax for a friend’s wedding. It was mid-July and it was hot ( hot for Novascotian standards, around 20C – Is Novascotian actually a word ?). Surprisingly, there weren’t too many people there. Those who stuck around, like a photographer in the picture, were able to see a beautiful sunset scene. This entry was posted in Computer Hardware and tagged SATA Express, Thunderbolt. Bookmark the permalink.